Home › Bible › God’s DNA…..Is it in your spiritual man, Literally? God’s DNA…..Is it in your spiritual man, Literally? O n April 2, 1953, James Watson and Francis Crick presented to the world for the very first time, the structure for DNA. DNA contains all the genetic information to create our entire bodies. DNA in our cells is very similar to an intricate computer program. DNA is made up of four chemicals, abbreviated as letters A, T, G, and C. They are by design. These letters are arranged in intricately within the human cell like this: CGTGTGACTCGCTCCTGAT and so on. The order in which they are arranged instructs the cell’s actions. The amazing thing is that within the tiny space in every cell in your body, the DNA code is three billion letters long. If you were to start reading off the letters that make up your DNA information, even if you read 3 letters a second it would take you thirty-one years, even reading 24 hours a day. That is the amount of DNA information in one cell! It has been determined that 99.9% of your DNA is similar to everyone’s genetic makeup.What is uniquely you comes in the fractional difference in how those three billion letters are sequenced in your cells. The U.S. government identifies everyone in our country by the arrangement of a nine-digit social security number. Yet, inside every cell in you is a three-billion-lettered DNA structure that belongs only to you. This code identifies you and continually instructs your cells’ behavior. There has never been a computer program in existence that wasn’t designed, any program, any piece of software or a message given through any language that did not have an intelligent design behind it. Dr. Antony Flew, a former atheist once questioned, “It is legitimate to ask oneself regarding this three billion letter code instructing the cell…who wrote this script, who placed this working code, inside the cell”? It’s like walking along, and you see initials carved out in a tree that read JD + MA, you know the tree itself did not form that—someone wrote it. It is a precise message. It is clear communication. In the same way, the DNA structure is a complex, three-billion-lettered script, informing and directing the cell’s process. On June 26, 2000, scientists completed the human genome sequencing. President Clinton congratulating them said, “Today we are learning the language in which God created life. We are gaining ever more awe for the complexity, the beauty, the wonder of God’s most divine and sacred gift. Dr. Francis Collins, the director of the project, followed Clinton’s words with his own saying, “It is humbling for me and awe-inspiring to realize that we have caught the first glimpse of our own instruction book, previously known only to God”. Oh yes, you shaped me first inside, then out; you formed me in my mother’s womb. I thank you, High God—you’re breathtaking! Body and soul, I am marvelously made! I worship in adoration—what a creation! You know me inside and out you know every bone in my body; You know exactly how I was made, bit by bit, how I was sculpted from nothing into something. Like an open book, you watched me grow from conception to birth; all the stages of my life were spread out before you, The days of my life all prepared before I’d even lived one day. Your thoughts—how rare, how beautiful! God, I’ll never comprehend them! I couldn’t even begin to count them— any more than I could count the sand of the sea. When looking at the DNA structure within the human body, we cannot escape the presence of intelligent (incredibly intelligent) design. But I believe it goes a step further for those who are in Christ, and here is where I switch gears. A friend and I were on the way back from the gym, and I proposed a question to him, as I do to you today? Is it possible that there is a spiritual DNA sequence to our spiritual man? I am not writing doctrine here mind you, just bringing up the question. God is a God of order. Everything that He has created has a divine sequence, a mathematical order if you please. I know that we become a new creation once we are born again because Paul writes in 2 Corinthians “That anyone who is in Christ has become a new creation. The old life is gone; a new life has begun. The word “New” as used here in the in the Greek implies a new nature that is quite different from anything that has previously existed. The word creature in the Greek here literally, means “creation” so and so the creature resulting from that creation is the person who is in Christ. We are in reality, not analogy, a new creature resulting from the blood of Christ Jesus. Now whether there is a “spiritual” DNA that is in that new creature, I do not know. I am just asking the question; is it possible that our spiritual man has actual, real “spiritual DNA”? We know from Galatians 2:20 that our old self has been crucified with Christ, and it is no longer we who live, but Christ living in us, merging with us. How do I know He merges with us, because He tells us so in 1 Corinthians 6:17, that he who is in union with the Lord is one with Him in spirit. That would account literally for a “new creation” that is alive, separate from our flesh. Take the angels for instance..they are not flesh and blood, but they are living creatures. Do they possess DNA? Our Lord himself says that it is too much for us to grasp and believe, when explaining the birth of our spiritual man, the “new creation” to Nicodemus. John 3:5-12 (New Living Translation) Jesus replied, “I assure you, no one can enter the Kingdom of God without being born of water and the Spirit.Humans can reproduce only human life, but the Holy Spirit gives birth to spiritual life. So don’t be surprised when I say, ‘Youmust be born again. The wind blows wherever it wants. Just as you can hear the wind but can’t tell where it comes from or where it is going, so you can’t explain how people are born of the Spirit.” How are these things possible?” Nicodemus asked. Jesus replied, “You are a respected Jewish teacher, and yet you don’t understand these things? I assure you, we tell you what we know and have seen, and yet you won’t believe our testimony. But if you don’t believe me when I tell you about earthly things, how can you possibly believe if I tell you about heavenly things? It is what Apostle Paul called a secret revealed in the Body of Christ Colossians 1:26-27 this message was kept secret for centuries and generations past, but now it has been revealed to God’s people. For God wanted them to know that the riches and glory of Christ are for you Gentiles, too. And this is the secret: Christ lives in you. This gives you assurance of sharing his glory. According to the Bible which is very simple but also incredibly complex, God is not only the Author of our existence, but he is the Relationship that makes our existence meaningful. God alone is responsible for the intangibles in our life that we live, responsible for giving these to us as we listen to him and trust him. He is our greatest, reliable guide in life. Just as he has engineered DNA to instruct and direct every human cell, he offers instruction and guidance engineered by the Blood of Christ to every aspect of our spiritual man who is one with Him. Our spiritual man engineered by God and brought alive by the Blood of the Lamb is instructed by His Spirit which is alive in us, to make our lives function well, for His glory and for His sake because He loves us. All creation is contained within the knowledge of God. There is nothing “outside” to God as God is the center of the universe and all creation, He is omnipresent. God is in constant contact with every atom in creation, and in contact with creation where no atom exists. You and I have the new DNA of God the Father by Christ Jesus. DNA , Divine Nature Acquired , its Divine because it’s the blood of Jesus, and we have his nature because that precious Blood has redeemed us, and lives in us as a “new creation”, giving us new names in the Lambs Book of Life, it’s acquired because he gave it to us on the Cross. 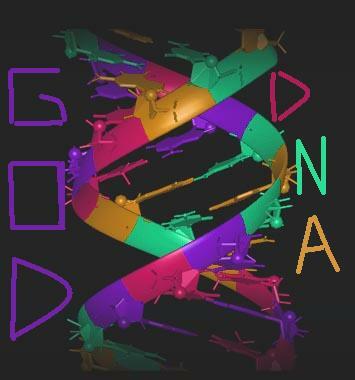 New DNA…The DNA of God, It’s in the Blood. ‹ Do you remember”Mr. Ed”the talking horse? His cousin is in the Bible! I was watching a TV special one night last week, and while filpping chanels; I heard them say they tested the blood that ran down from the cross to the skull in the cave…and it came up AB – / or AB + or something like that. Any one else see that? May I suggest PSALMS CODE for further and fascinating info on what’s hidden in Psalms. 🙂 there’s definitely a change when you are reborn, and i believe very much that its a physical one as well as in every other way. spiritual DNA, i like that. I love this blog! We also see in Galatians 3:18 that we receive the free gift of inheritance from God when we are believers. Webster’s dictionary says that inheritance is genetic characters transmitted from parent to offspring. Genetic character is DNA! All wrapped in a nice package for us in the blood. Wow, praise God! If Able’s blood still cries out, how much greater would the cry be from Christ’s Blood that was shed on to this earth for man’s redemption. It has the actual DNA of our heavenly Father, God Himself. Hello well it has been awhile since the comments were on this subject. Nice to be part of a blog and have signed in on FB to your page. Thanks for the interesting articles and being there online as a Pastor. It is special. I am part of a House Church which is out of the box and into the market place if you would put it that way…It is exciting. Community is wonderful. Will keep an eye on this blog and FB. HE is so good…Amen. Good evening. This was a great read! You might be interested in taking a look at what Neville Johnson has to say about God’s DNA inside of us.. search for The Perfect Man Christ In Us by Neville Johnson on YouTube.